Eric Snow (born April 24, 1973) is an American retired professional basketball player and businessman. He is currently the Assistant Coach for the Florida Atlantic Owls men's basketball team. Snow attended college at Michigan State University. He played varsity basketball at Michigan State under head coach Jud Heathcote. In his senior season, the Spartans earned a #3 seed to the 1995 NCAA Tournament, but they were upset in the first round by Weber State University. After college, Snow was chosen by the Milwaukee Bucks in the second round of the 1995 NBA draft. He was immediately traded to the Seattle SuperSonics, where he played sparingly for the next two-and-one-half seasons. On January 18, 1998, Snow was acquired from Seattle by the Philadelphia 76ers in exchange for a second-round draft pick. He was immediately inserted into the 76ers' starting lineup by head coach Larry Brown, and after averaging only 18.0 minutes per game (then a career high) for the first half of the season with Seattle, he averaged 35.8 minutes per game for the remainder of the season with Philadelphia. As a pass-first, defensive-minded point guard, Snow became a stalwart of the Brown-era 76ers teams, due largely to his ability to guard the opposing team's shooting guards, which made him an ideal complement to his diminutive but high-scoring backcourt mate Allen Iverson. Despite missing thirty-two games early in the 2000–01 season due to injury, Snow played a crucial role in helping the 76ers earn the top playoff seed in the Eastern Conference and ultimately reach the 2001 NBA Finals, where they lost in five games to the Los Angeles Lakers. During the following season, Lakers shooting guard Kobe Bryant stated that nobody in the league defended him better than Snow. In 2002–03, Snow posted career highs in points per game (12.9), rebounds per game (3.7), minutes per game (37.9), field goal percentage (45.2%), and free throw percentage (85.8%). Snow's excellent free throw percentage was particularly noteworthy, as he had been a very poor foul shooter in college and early in his NBA career, averaging 52.1% from the stripe during his four seasons at Michigan State and 59.2% as a rookie. He also averaged 6.6 assists and 1.6 steals per game in 2002–03. As of the end of the 2007–08 season, Snow's career averages stood at 6.8 points, 5.0 assists, 2.5 rebounds, and 1.2 steals in 27.3 minutes per game. Snow reached the NBA Finals three times—once with each of the teams on which he has played in his career: the SuperSonics in 1996, the 76ers in 2001, and the Cleveland Cavaliers in 2007. Unfortunately for Snow, all three teams lost in the finals. On July 20, 2004, Snow was traded to the Cavaliers in exchange for Kevin Ollie and Kedrick Brown. Snow played in 81 games (starting 15). He was suspended without pay for a December 18, 2004 game against the Boston Celtics after a confrontation with Paul Silas, the coach of the Cavaliers. It was the only game that Snow missed in his first three years with the Cavaliers. Snow averaged 4.0 points and 3.9 assists per game. He had a season-high 16 points on January 22, 2005 against the Golden State Warriors and a season-high 13 assists on April 19, 2005 against the Boston Celtics (which is also his high assist total as a Cavalier). Snow ranked fifth in the NBA in assist-to-turnover ratio (3.56). Snow donated $20 for every one of his steals and assists during the 2004–05 season. Snow played in and started all 82 games for the Cavaliers. He averaged 4.8 points and 4.2 assists per game. His point and assist averages are his highest as a Cavalier. He had a season high 14 points on two occasions and a season high 11 assists on March 7, 2006 against the Toronto Raptors. Snow started all 13 playoff games for the Cavaliers. He upped his scoring average to 6.6 points per game and had an 18-point game in a Game 5 victory over the Washington Wizards during the first round of the playoffs. For the fifth time in his career, Snow played in all 82 games (starting 45). He averaged 4.3 points and 4.0 assists per game. He had a season high 18 points on January 13, 2007 against the Los Angeles Clippers (which is also his high point total in the regular season as a Cavalier) and a season high 11 assists on January 20, 2007 against the Golden State Warriors. On January 30, 2007, Daniel Gibson was inserted in place of Snow in the Cavaliers' starting lineup, bringing an end to a streak of starts that lasted for 127 games. As a starter in the 2006–2007 season, Snow averaged 5.1 points and 4.5 assists per game. Snow played in 19 of the 20 Cavaliers playoff games. He averaged 1.7 points, 1.5 rebounds, and 1.5 assists. In his 13th NBA season, Snow played in 22 games and started five. He averaged 1.0 points and 1.9 assists per game. He had a season high five points on December 2, 2007 against the Boston Celtics and a season high six assists on December 15, 2007 against the Philadelphia 76ers. As a starter, Snow averaged four assists per game. On March 11, 2008, it was announced that Snow would miss four to six weeks due to arthritic-related symptoms in his left knee. He did not play another game for the Cleveland Cavaliers in the 2007–08 regular season. The Akron Beacon Journal's Brian Windhorst reported that Snow will not play in 2008–09 because of chronic left knee problems stemming from the injury sustained in 2007, and is retiring. 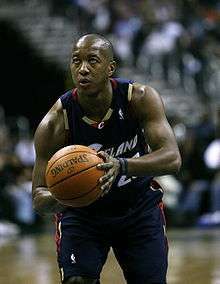 Eric Snow was also named captain of the Cleveland Cavaliers in 2007–08, along with LeBron James. Snow tore cartilage in his knee prior to the 2008–09 season; he has been unable to play since the injury. Instead, he served on Head Coach Mike Brown's staff as an assistant coach. This arrangement was unofficial, as Snow was still listed as a player on the Cavs' roster. He also worked as an analyst for NBA TV. On April 4, 2009, Snow was officially released by the Cavs. Because the release was deemed "medically necessary", the Cavs were not required to pay his salary. Snow is the younger brother of former linebacker Percy Snow, who also played at Michigan State University, and for both the Kansas City Chiefs and the Chicago Bears of the NFL. ↑ "Eric Snow, Robbie Laing hired as FAU basketball assistant coaches"
↑ "Sixers' Guard Leaves Bryant Snowed Under", The Washington Post, 2002-04-07. Retrieved on 2008-11-11.